User experience design for SharePoint and Intranets. Content Formula is frequently approached by organisations whose intranets deliver a poor experience to their users. Often users cannot find information or cannot complete tasks as a result of confusing navigation and poor design. Poor UX and IA create frustration and negatively impact user adoption resulting in disappointing ROI for your intranet. 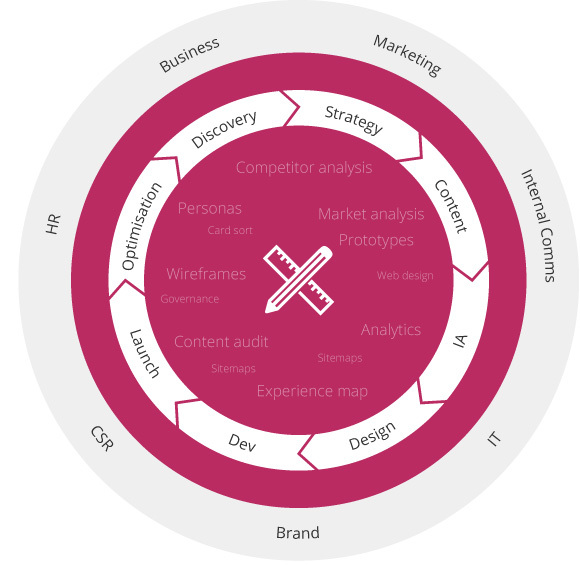 Content Formula advocates a robust UX process, the foundations of which lie in a discovery stage designed to get under the skin of the organisation, its processes, its people and its culture. We believe that the information architecture of your intranet should speed up your users ability to find information and complete everyday tasks. We believe in simple, clear navigation and labelling and will work closely with your stakeholders and users to understand the best way to deliver that for your organisation. Our UX and design teams have worked with SharePoint since its launch. It is this knowledge of how best to apply user experience design to SharePoint that ensures intranets created by Content Formula are widely adopted throughout your organisation, delivering desirable return on investment.